The Eastern part of the Netherlands is known as the greenest part of the country. The area, mainly formed by the provinces of Overijssel and Gelderland, has many forests and many large and beautiful estates with land houses and castles. On the countryside, meadows are surrounded by lanes of trees and shrubs. Villages and towns have parks, some of them stem from centuries ago and are still very well maintained. Altogether, this part of the country is very green indeed. Blessed by a favorable mild climate, all fauna grows every year by the power of the sun. The volume of biomass grows every year anew. Besides these natural resources, there are many other biomass resources continuously coming available from the agro-and wood industry and from many municipal waste streams. A large part of these resources is still not being used for energy. Biomass is an important energy resource, for this and for future generations. By additional efforts and enhanced cooperation between bio-energy parties, it should be possible to meet half of the regional climate change carbon target by bio-energy. Bioenergy is important for Eastern Netherlands, now and in the future. Enormous global challenges in the energy field lie ahead. Technologies currently available, fall short. Both continuous improvements of current systems and development of completely new concepts and conversion routes remain necessary. In Eastern Netherlands, a unique combination of science centers, technology companies, and renewable energy companies can be found. All parties with a strong track of record in bio-energy. By strong cooperation between these parties, important innovations can be implemented swiftly from lab concept to market application. The first objective of the bio-energy cluster is to promote the use of bio-energy in the Eastern part of the Netherlands. The second is to promote bio-energy technology development in the region to foster sustainable economic growth and export potential. The cluster wants to meet these goals by enhancing cooperation between organisations, institutes, and enterprises in the Eastern part of the Netherlands. The cluster supports the local government in reaching its climate change carbon reduction targets. 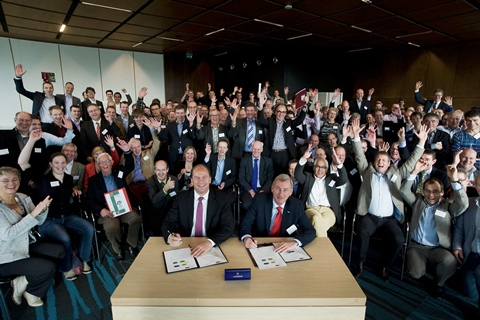 A covenant has been signed between the Province of Overijssel and the cluster, outlining joined objectives and commitments from both sides. 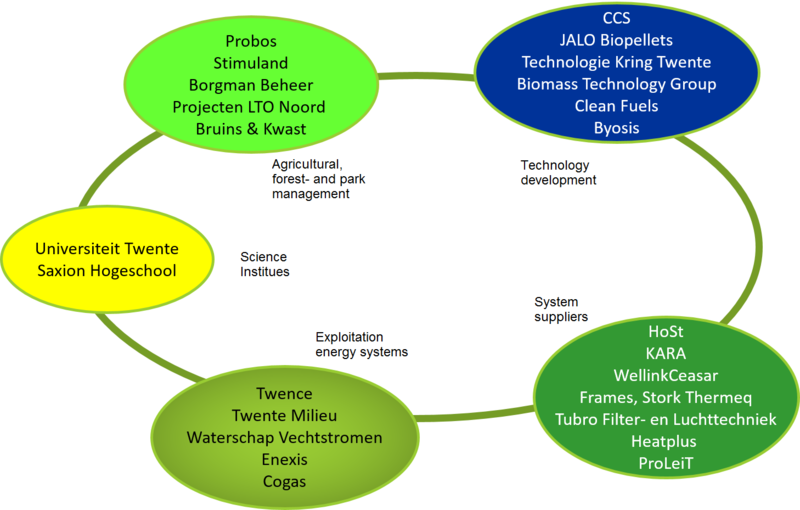 The cluster aims to be a fertile environment for successful bioenergy technology development. The cluster is formed by bio-energy parties with well matching qualities, focus, and scope of operation. Special is the complete coverage of the chain from a fuel supply to energy production. Also remarkable is the presence of the full technology development chain within the group: the full range from concept development to market product is covered (see diagram). This makes the cooperation unique in the Netherlands and beyond. biomass combustion systems for heating and/or electricity production. The cluster is a foundation by legal entity. Yet, it works very much like an association with strong roles for the inidividual members. The board of the foundation consists of members nominated by the member organisations, with a high standing and reputation in the filed of bio-energy. A cluster coordinator has been assigned to lead the cluster activities. He is supported by a group of experts that have been made available by the cluster members.